Add 1 rep each minute, 2nd min, 2 OHS, 2 pull ups, 2 ring dips etc until reaching 10 minutes. Post number of rounds and reps completed. Doris, Workout 15.2 at CrossFit Mornington. 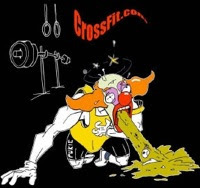 One week remaining for the CrossFit video contest, deadline: March 16, 2015.